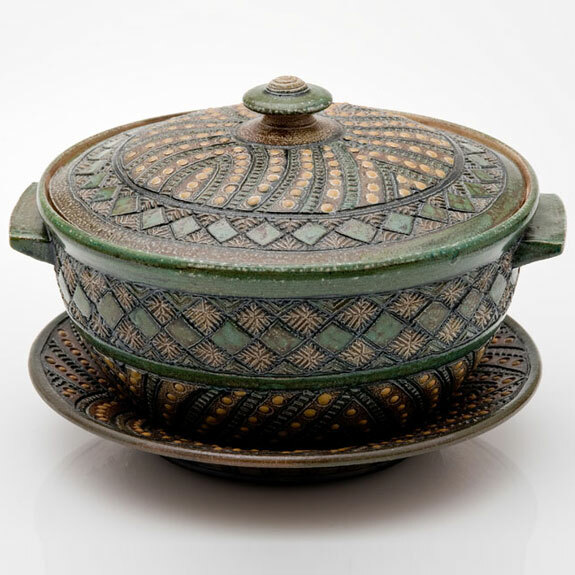 Here’s a large, lidded casserole that has a charger or service plate to match. Plate, casserole, and lid were thrown at the wheel from stoneware clay. Handles were applied to the casserole while it was still very soft for best adherence. Each piece was trimmed on the wheel, and a knob was added to the lid. The piece was wrapped in plastic for slow drying, and texture was applied by a hand drawing process several days later. After bisque firing, the casserole and plate were painted with slips, glazed on interior surfaces, and fired to Cone 10 in a salt kiln. $250, 14″ diameter, 9″ tall, Sold; special orders accepted.